Savoring the strawberry season - oh, yeah! I was lucky enough to meet Dona Bumgarner during the course of the 2012 Blogathon. She writes of her experience and reflections on being a mother and a gardener at Aubergine. Today she shares her thoughts on raising a child with a taste for seasonal fare. Enjoy! Oh, and you can see what I wrote about finding inspiration here, there, and everywhere over at her blog! My daughter's first solid food was a yellow nectarine. I was eating it while I walked around the farmer's market on a hot August afternoon last summer and she rode on my chest in her Ergo carrier. I didn't think she was paying attention to what I was eating until she reached up and plucked the fruit from my hand just as I was about to take a bite. She was six months old and had four teeth by then, but she wasn't really interested in food for nourishment yet. She gripped it in both hands and held it to her mouth, sucking the juice and exploring the texture with her tongue. She loved it. There was no way I was going to get that nectarine back from her. Our family is lucky to live on the central coast of California where the mild weather allows a usually long growing season and where organic farming practices are the norm rather than the exception. We have several year-round farmer's markets to choose from and more that run during the height of the growing season. Our decision to eat locally-produced food came from a desire to reduce our carbon footprint as well as to invest in our own local economy. The unexpected benefit is that we eat mostly fruits and vegetables that are in season. Studies have shown that eating this way is best for our health, but we do it because it feels - and tastes! - really good. Have you ever eaten a tomato straight off the vine in July, warm from the sun and bursting with juice? Compare that to eating one of the bland and unnaturally bright red tomatoes from the supermarket in December and you will understand what I mean. 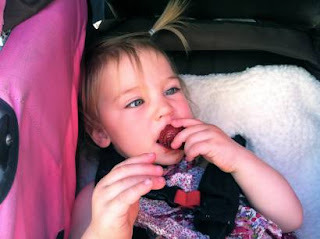 During the first year my daughter was an eater I introduced her to new foods as they came into season. She mouthed the last of the stone fruits last summer. We ate slices of pear in the fall and I roasted winter squashes cut into large chunks that she could hold herself. In winter we discovered she loved mandarin oranges and my avkolemeno soup with the tang of lemon, but can't stand the texture of an avocado. She learned how to use her new teeth to scrape clean the leaf of an artichoke when they were plentiful in January, and ate tender steamed asparagus spears by holding them in her fist like a breadstick in February. In March she samples fresh sweet peas straight from the pod in her grandmother's garden and in April she tried her first strawberry. That first berry came from Windmill Farms. This Dutch farmer has land in the middle of an urban neighborhood and grows the best strawberries I've ever eaten. They are small and sweet and deep red all the way through. He sells out every week, even though he arrives with a tower of berry flats that seem endless. I squatted down in front of her stroller with my prized basket of berries and offered her one. She took it from my hand and turned it over, examaning it. It was shiny and plump and a delicious shade of red. She took a tiny bite and raised her eyebrows like she does when she's excited about something. The she mashed the whole berry into her mouth and bit down so the juice ran down her chin. She chewed and swallowed and signed emphatically, "More, more!" This is the kind of eater I want to raise: One who loves good food and understands where it comes from. One who will pick cherry tomatoes with me from the garden in July. One who will visit the market with me each week and get to know the farmers. One who will be excited for the best peaches when they come ripe in August and pick wild blackberries for jam in the last days of summer. One who will sit with me on the curb on a sunny April day and gorge on the season's first perfectly ripe strawberries until red juice runs down both of our chins. Leave a comment and tell me about your family's favorite seasonal treats. Doña Bumgarner is a writer, mom, and gardener. She is currently loving the bustle of the summer market and sunny days in the garden with her toddler. You can find her musings on motherhood in midlife, among other things, on her blog, Aubergine. Really is priceless to enjoy the foods in season. Today we took Mona (2.5 y/o) to the strawberry patch and picked fresh berries, eating most of them on the spot. From there we moved onto the mulberry bush where the fruits are just starting to ripen. Mona loved searching for the dark colored ripe ones, pulling them off, and eating them directly. But the pricelessness does not come from the freshness alone - that is only a small part of it. Soon she will learn that this is a once-a-year experience, and one to look forward to and savor each year, just as she has learned not to ask for fuki-no-to (her favorite early spring goodie). Soon it will be watermelon and corn, and then it will be gone. During winter she rarely ate tomatoes (maybe once or twice), but she loves them so I can't wait until the tomatoes in our area start to ripen. And in the fall she will once again devour the persimmons as much as possible for the one month they are available. I look forward to her being so in-tune with the seasons that she will be able to anticipate what is next, and learn to savor it for its fleeting goodness. This is what makes me think life is great. That's the kind eater I wanted to raise, too. Guess I did! Kevin, I think that is one of the most wonderful comments I've read on this blog. It does make life great. I look forward to hearing of her adventures in seasonal eating on your blog. YorkshireMom, Yeah! I'm glad to hear that, too. I just spoke with a group last night about taking some of the first steps in learning to eat seasonally in Japan. I'm so excited for them. The routes to explore are endless.